Quonset hut kits and metal garages for sale. 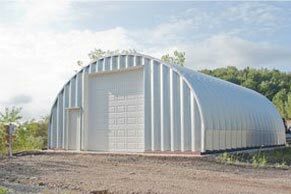 Metal Building Kings® arched style quonset hut metal garage kits for sale. Complete information including pricing, ordering and features. 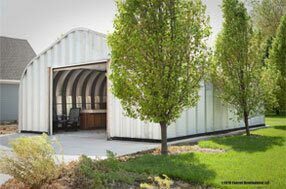 The quonset hut metal building kit (see history and description of the quonset hut here) is a favorite among many industries across America, especially homeowners and small businesses. 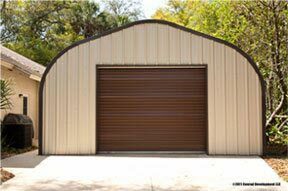 Homeowners use the quonset hut as an extra garage, workshop or storage building. 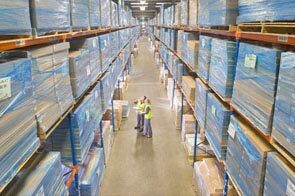 Small businesses prefer it as a retail shop, auto body shop, or warehouse building among many other uses. 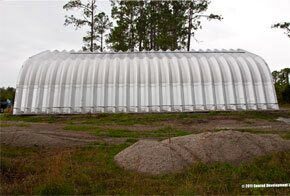 The quonset hut provides a sound, durable economical structure superior to a wood framed building. Prefab metal garages are also superior to other metal buildings in that they are lower cost, provide maximum security and are pre-engineered metal building systems built to withstand hurricane force winds, earthquakes, and the most severe weather imaginable. 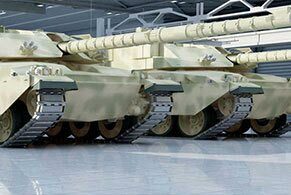 Made of 80,000ksi tensile yield carbon Galvalume steel coated with aluminum-zinc alloy (see the specifications here) the materials and exterior are made to last decades virtually maintenance free. The cost of the structure is often less than $6.00 a square foot not including the cement floor. Depending on what accessories you will need like ventilation, garage kit insulation, windows, skylights and custom end walls the cost is almost always less than any other steel structure. There are also less time with building code inspections to deal with vs. a wood frame building. Zoning enforcers appreciate the metal garage kit because they know how superior it is to traditional wood frame garages. If you price a metal building kit you will find that Metal Building Kings garage kit prices are very competitive. You can choose any size that fits your needs. Choose up to 150 feet wide and up to 40 feet high and as long as you need because the pre-engineered metal building system is built in sections so you can design it any size you need. You can choose from a variety of metal building colors or ask us about our custom color selections. The paint and synthetic resins used is the most innovative silicone protected polyester technology available in the market today. The paint ( Energy Star Approved) acts as a thermal barrier because it reflects up to 70% of the sun’s rays keeping the metal building interior cooler and more energy efficient. The front and back of the building, referred to as “End Walls” are fully customizable. You can add any type of garage door, walk through doors, electronic powered roll up gateways. There are several types of doors for steel buildings. Sectional doors divided in horizontal sections are electronically operated like your home garage door. 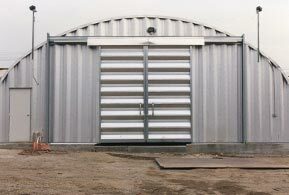 Metal Roll up doors are similar to sectional doors but with many more sections and far more rugged. Bi-fold doors have two panels hinged at the top and provides a large opening for big vehicles and planes. Sliding doors, often used for horse barns are manually operated. 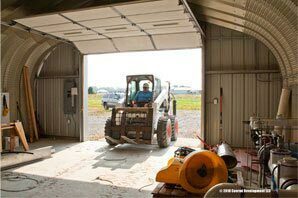 Hangar and agricultural doors span wide distances and are made of heavy duty gauge steel. You can customize your end walls for home use to appear similar to your existing home. Build brick walls or wooden walls that include windows and walk through doors. The finished result is an attractive garage that fits in nicely in any neighborhood. You only need a concrete slab poured that the building is typically bolted down to. There are two types of foundations and ways to construct them depending on the climate where your building is. 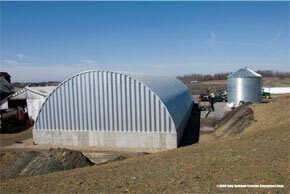 (See more information on foundations for steel arch buildings). 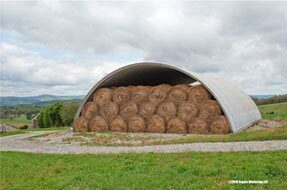 The majority of quonset hut owners erect their building themselves. You only need a crew of 4-5 people with scaffolding as high as the pitch of the building. You can rent the scaffolding and return it when the structure is complete. The building is assembled (See assembly tips here) with minimal amount of tools that you probably already have. Basically all garage kit models arrive in sections that are bolted together one at a time until the structure is complete. This will save you thousands of dollars on construction costs and labor for contractors giving you a large building for less cost. When it is finished you have a steel building bolted down to concrete and that structure is solid! 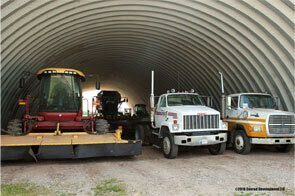 In the most severe areas of the world where extreme sub zero temperatures are intolerable, top professionals working in those conditions prefer quonset huts as their first choice. When insulated they provide a comfortable interior unlike any other manufactured structure. 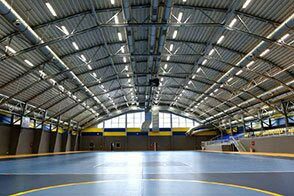 And in the heat of summer climate controlled interiors cost less than other structures.